At the end of this semester, Babaji completed two classes that began in the latter half of the second year. One of them was the study of Alaṅkāra Kaustubha, Kavi Karnapūra’s massive work on poetry, its embellishments, how it creates rasa, and the flaws to be avoided, expertly revealing these features and flaws by using poetic stanzas of Kṛṣṇa’s pastimes with the gopīs. The second class completed was on Bhagavad Sandarbha, the second of Śrī Jīva Gosvāmī’s Ṣaḍ Sandarbha. Bhagavad Sandarbha elaborates further the answer to the question of how we can know the Absolute Truth, which was introduced in Tattva Sandarbha with the “vadanti tat” verse and will continue through Paramātma Sandarbha. In Bhagavad Sandarbha, Śrī Jīva defines Bhagavān, Paramātmā and Brahman and explains the distinctions between them. He then elaborates on Bhagavan’s characteristics and expounds that He can be known theoretically through scriptures (śabda-pramāṇa) but ultimately experienced only through bhakti. 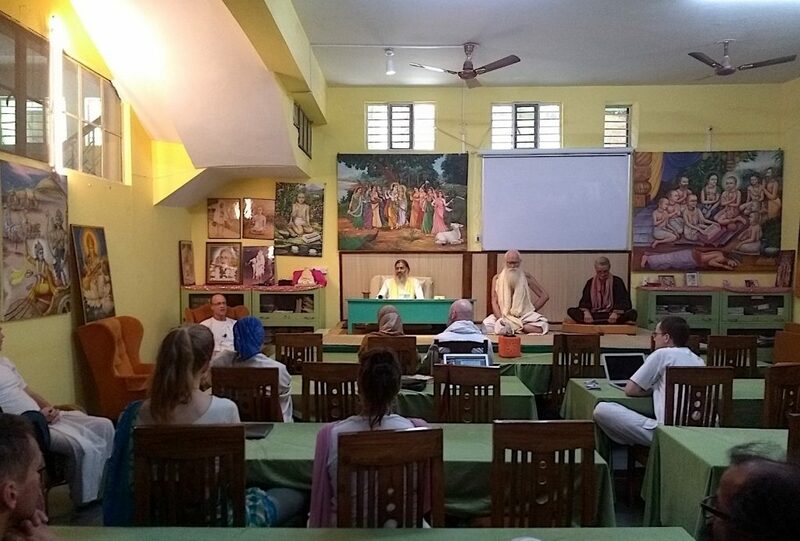 On Friday 29th, the last day of this semester, our teachers Babaji Maharaja, Jagadananda prabhu, Swamini Radhika Devi, and Navadvipa prabhu as guest speaker offered a closing ceremony. Babaji pointed out that there are many books in our sampradāya that have either not yet been discovered or that have been lost due to a lack of interest. In the past, these books were copied by hand, and if they were not read, were bound to disappear. He further mentioned that this Bhakti Tirtha course is an inspiring model for other Vaiṣṇava groups, who are now also taking up similar systematic studies. Finally, Babaji thanked the students because without students, there is no course. A teacher’s success depends on the students. Sanskrit teacher Jagadananda prabhu pointed out that Jiva Institute is a developing Institution that offers and supports intellectual discussions on Vaishnavism. In the same vein, our vernacular and Sanskrit poetry teacher Radhika Devi appreciated the diversity and high level of philosophical tolerance at Jiva Institute. She wants her students to have an experience of the real Vrindavan and strives to give them the tools for such an experience. 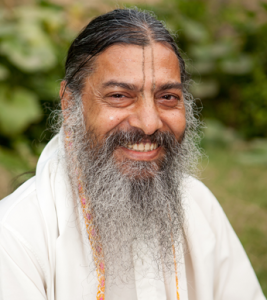 Babaji’s longstanding friend and Sandarbha editor, Navadvipa prabhu, shared his early experiences with Babaji in ISKCON and the formative years of Jiva Institute. He spoke about Babaji’s struggle to establish the Institute and his determined vision to translate the Sandarbhas and create a sanctuary for teaching, where he could speak openly and without any reservation. The Bhakti Tirtha course is the fruit of this endeavor. New students are welcome but are recommended to listen to the previous recordings before the new semester starts. Every morning there will be kīrtana from 9.00 to 9:50. Everyone is welcome to join. Besides the regular schedule, we will also have additional classes and weekend seminars, which will be announced in our Bhakti Tirtha email group. Further, a japa retreat is planned before or after the course. During the Rutgers student program (tentatively at the end of the year and the first two weeks of 2020), there will be a winter break, but students are welcome to attend the program. Accommodation: Ashram: $ 150 per month. $ 800 for 6 months in advance. Please go through the product description before making a purchase as we don’t entertain refunds.